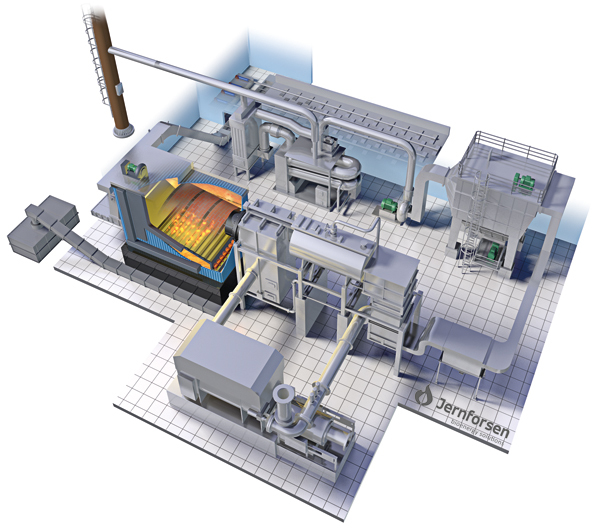 Jernforsen's combustion system is optimized in a CHP plant. A high pressure boiler is attached to a furnace and can, depending on the steam need, produce steam up to 25 tonnes / h and 480 ° C in one or two stages. The boiler design is our own and it is optimized to meet the technical data in balance with the investment cost. The high-pressure steam is led to the turbine, which can be a one or two-stage turbine, depending on your needs. The system is optimized depending on the choice of back pressure or condensation design.